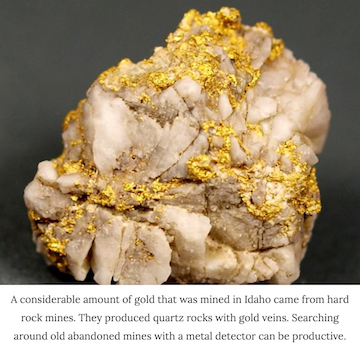 Idaho is a fantastic state to prospect for gold. Over 2/3 of the state is public land, much of it managed by the BLM and Forest Service. These areas are generally open to mineral exploration, and Idaho has a rich history. Gold has been found throughout the state, with rich discoveries found throughout dozens of mining districts. Many areas that have gold are far off the beaten path, so a prospector who is willing to put in a little “leg work” has the chance of finding some very good places to mine. The Boise Basin gold strike in 1862 was easily the largest discovery in the state, with millions of ounces of gold recovered from the region. The Boise Basin encompassed an area that included several mining towns including Idaho City, Placerville, Pioneerville, and Centerville. All of the streams in this area produce gold, with extensive working done by hand placer, and later by hydraulic mining and bucket line dredging. Within a few years of the first gold strike, the Boise Basin had a larger population than Portland, Oregon. This area is not known for producing large nuggets. It generally produces fines and small picker sized pieces of gold. Although large nuggets are not common, large specimens of gold in quartz have been found, weighing several pounds in size. To the southeast of the Boise Basin in Elmore County were several gold districts worthy of mention. Shadowed by the beautiful Sawtooth Mountains, the small mining town of Atlanta produced significant amounts of gold in both placer and lode deposits. There is still plenty of gold left to be found in this remote mining region. Other notable areas in Elmore County include the areas near present day Pine and Featherville. Located near the headwaters of the South Fork Boise River, all waters in this area produced gold and are worth prospecting. Silver City is a well-known mining town in Owyhee County, Idaho. Silver was found here on War Eagle Mountain in 1864, and thousands converged on the high desert valley. Although, the vast majority of mineral recovered here were from hard rock deposits, there is plenty of gold in Jordan Creek and a few other seasonal streams. (Silver City is also one of the finest existing ghost towns in the US, definitely worth a visit if you are ever in Southern Idaho). Florence is a remote mining district in Central Idaho. Prospectors discovered this area after nearby discoveries in Pierce attracted thousands of men to the area in search of gold. The high elevation and remote location makes for a shorter than average mining season due to snow levels. 4000 feet below Florence is the Salmon River, which also contains plenty of fine gold, and good access along highway 95. The Silver Valley Mining District is in the northern panhandle region of Idaho, and includes the mining town of Wallace. This regions is one of the most mineral rich areas of the state, although by far the most important mineral is silver, followed by lead and zinc. In fact, it is one of the top silver producers in the world, with nearly one billion ounces of silver produced. 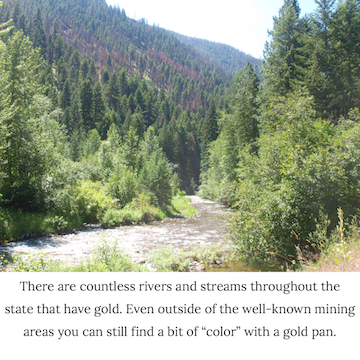 Placer gold can be found in many of the nearby creeks and rivers in the area. Another place to visit nearby is Murray, a rich gold mining town north of Wallace that has produced its fair share of gold over the years. There are literally thousands of mines and prospects scattered across the state of Idaho. Almost any creek or river in Central Idaho probably has some gold in it. 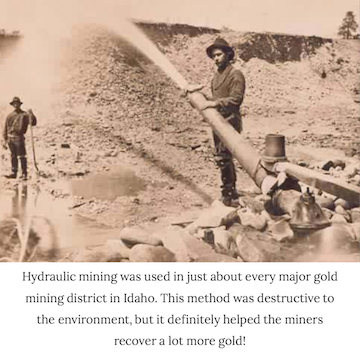 A few other notable areas that have produced gold in Idaho include the mining towns of Warren which was dredge extensively along Warren Creek. South of Challis is the small town of Bayhorse, which was primarily a silver producer. It is now owned by the State of Idaho and is open to visitors. The ghost town of Yellowjacket is deep in the central Idaho wilderness. Very few people have visited this remote mining camp, but it flourished for many years primarily as a lode gold producer. Leesburg is yet another old mining district the was rich with placer gold. It is west of the town of Salmon and takes some effort to get to. The Yankee Fork Valley produced a lot of gold during its heyday. The ghost town of Custer is still well-preserved. You can also visit the nearby Yankee Fork Dredge that churned up the valley in search of gold. Elk City was a major mining town for a short time. Placers can be found in the Red River, American River, and all throughout the South Fork of the Clearwater River. There is a good chance that if you are on a creek in northern or central Idaho, you will be able to find some gold if you look hard enough. Even in areas that haven't had any significant mining activity, it is still relatively easy to find gold in many locations. It is also worth mention that Idaho is the most remote state in the lower 48, so be smart when venturing into the backcountry. It is very possible to go days or weeks without seeing another person. Always carry the appropriate supplies with you, including tools, spare tires, food, water, first aid, and other safety gear. 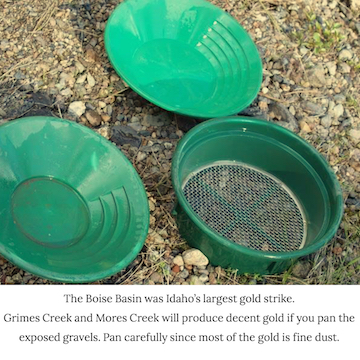 Want more information about gold prospecting in Idaho? Get our eBook!